am motivated to write on Joe Turner’s topic, “But I Didn’t See Him!” (May 2016, p. 36). I will not focus on the physical inability to see motorcyclists as Mr. Turner does, but rather on the mental inability to do so. I don’t refer strictly to angular invisibility, as Mr. Turner does, but to the situation in which an automobile facing us turns left across our lane in front of us – a situation which is common and about which I have read there are many accidents where the motorcyclist loses. I was taught, as Mr. Turner wisely cautions, “Never assume a car driver sees you.” I was also taught that, in this left-turn situation, one should seek to establish actual eye contact with the driver of the oncoming car, and still assume he’ll turn left in front of you. That is unless your eye contact persuades you, perhaps with waves and head nods, that the oncoming driver actually sees you, acknowledges your presence, understands you have the right-of-way and is prepared to yield it to you. M y musing about this left-turn situation includes a point I read years ago, that the most visible vehicle to a car driver is a motorcycle policeman. That got me thinking that there is some mental function going on wherein the brain seems to prioritize risks. So in traffic, the oncoming driver sees the motorcycle policeman but does not see a non-police motorcycle. The oncoming driver will rarely turn left in the face of an oncoming massive truck, and probably not in front of the average car. 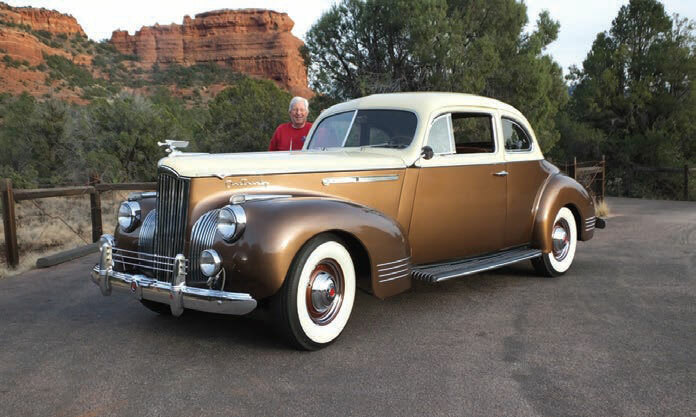 I had a relevant experience in which I was driving my 1941 Packard. I was proceeding westward on the main street through the town in which I live. A woman was driving a car east toward me in the opposite lane. Suddenly the woman turned left in front of me as if I wasn’t there. Fortunately a Packard has excellent brakes, which I used suddenly and to good effect. I think the woman never saw me. And I began to figure that perhaps she didn’t see me because her experience hasn’t included seeing cars such as a Packard. Her brain simply didn’t register a risk. I have come to think that our brains have a subconscious automatic risk-assessment and prioritizing ability. The brain registers risk if oncoming traffic is oversized or a commonly seen vehicle. It registers low or no risk if the oncomer is a motorcyclist, unless the motorcyclist is clearly the police. Once while on my Wing, waiting at a red light, an elderly lady walked up to me and addressed me as “Officer.” I figured she saw (1) my big bike – a 1975 Gold Wing with large white fairing, and (2) its driver wearing a full-face white helmet. The lady’s mind registered me as police, and therefore, approachable for information. I think this subconscious auto-prioritizing is going to be increasingly important to motorcyclists as automobiles acquire new electronic competence and other digital gadgets take hold in our lives. Thanks to Joe Turner for his excellent article. I’m sure he joins me in wishing us all: Keep the rubber on the road! Posted 06/30/2016 by wing & filed under GWRRA.